Offering complete control via your smartphone, this home security alarm is easy to install and to use. Wi-Fi enabled IP camera captures HD 720p video. 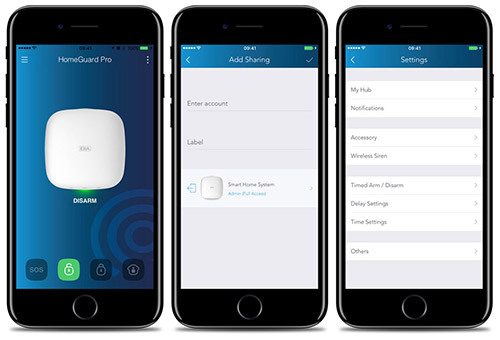 The ERA HomeGuard Smart Alarm Pro - Elite Kit is a cloud based, wireless smart alarm with integrated Wi-Fi connectivity and SIM Card holder. The system is operated via a smartphone app and can also be armed and disarmed with one of the included remote controls, or the wireless RFID keypad. When the alarm is triggered, a loud 93dB siren will sound from the alarm hub to alert others of an intruder and the system will also alert you via phone call or app notification. This alarm kit also includes a wireless solar powered external siren box which produces an 110db siren. The system can store up to 5 emergency phone numbers, in case of a triggered alarm, and will call each stored phone number in sequence until the alert has been answered. The Elite Alarm Pro connects up to 50 sensors and 10 remote controls, allowing you to customise your alarm system to suit your property and lifestyle. ERA Wi-Fi Enabled IP Camera will capture HD 720p video recordings, day or night, which you can view via your smartphone. The Wireless RFID Keypad, supplied with 2 RFID tags, is used to arm or disarm the alarm system via entry of your own 4 digit PIN code or by simply swiping an RFID tag across the keypad.